I have worked in the Cardiology Service at Virgen de la Victoria University Hospital since 1997. After completing my MIR training (2002), I became a specialist in cardiology (2002) and have subsequently carried out my professional duties as a cardiologist in the Cardiology Department , where I continue to strive to provide excellence of service for our patients, developing new services such as medical care for patients with rare diseases (for instance, those affected by Marfan syndrome) who often do not receive adequate care due to the complexity of their condition. In addition, I have extensive experience both in teaching, as tutor of specialist trainees (and spokesman on the Teaching Commission), and in research: My scientific papers have appeared in international specialist publications, I have addressed international conferences and my cardiology reference works have been published in Spanish, I also direct doctoral theses and have participated in various major research projects and clinical tests of a national and international scope. Another facet of my professional life is teaching, which I undertake at the University of Malaga where I lecture in Anatomy, teach postgraduate courses and am the clinical tutor of Medical Pathology. This affords me the personal satisfaction of participating in the essential mission of training medical students and doctors in medicine so that they can practice their profession to the highest standards in their future careers. The Heart Area of the Virgen de la Victoria University Hospital specialises in clinical cardiology, heart surgery, hemodynamics, arrhythmias, electrophysiology, congenital heart conditions in adults, cardiac rehabilitation, diagnosis with non-invasive imaging: coronary artery scans and heart magnetic resonance imaging (Heart MRI). 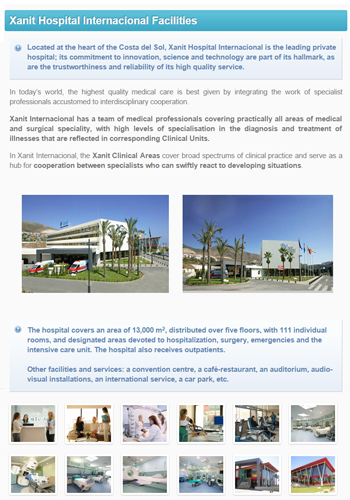 Xanit International Hospital is the reference private hospital located at the heart of Costa del Sol and is characterised by its heavy commitment to innovation in science and technology and for offering a service based on quality that inspires confidence. Recipient of the Industry Awards prize for the best Hospital , Xanit International has a full team of medical professionals to cover practically all medical and surgical specialities, with high levels of specialisation in the diagnosis and treatment of certain conditions, as may be seen from the range of Clinical Units that includes the Cardiology Department, of which I am a member. In Xanit International Hospital, I head the Clinical Area of the Cardiology Service. Thanks to a perfectly coordinated team of professionals of the highest level , we offer the best multi-disciplinary medical care to each patient with unanimous commitment. The medical professionals of the Instituto Cardiotecnológico (Xanit's Cardiology Department) take particular care to provide a personalised service, striving to offer the best and most extensive service in cardiovascular health. The Instituto Cardiotecnológico's fundamental aim is to meet the needs of people at risk of suffering from cardiovascular conditions and diseases, or of diagnosed patients who require comprehensive care and the expert professionals from different specialities who can provide medical attention for these conditions as a fully coordinated team. We carry out our work in Xanit International Hospital , Benalmadena (Malaga), which provides the unequalled facilities, installations and human resources that are essential to achieve excellence in hospital health care. Xanit International Hospital specialises in clinical cardiology, heart surgery, arrhythmias-electrophysiology, hemodynamics, diagnostic and therapeutic cardiac catheterization, pediatric cardiology, cardiac rehabilitation and diagnosis with non-invasive imaging: coronary artery scan, echocardiography and cardiac MRI. At the Centro Cardiovascular Strachan, close collaboration between the surgeons and the other cardiologists, in conjunction with the most advanced imaging equipment means that we can provide treatment that is highly specific and individual to each cardiac valve problem or cardiopathy that may be the subject of a consultation. My specialist training in non-invasive imaging techniques, as a Certified Expert in Advanced Echocardiography since 2005 and with a Master in Cardiac Imaging awarded by the Sociedad Española de Cardiología, have helped develop my broad knowledge of diverse pathologies or heart conditions. Together with my extensive experience in diagnosis with ultrasound imaging ( Colour Doppler echocardiography ), this means that I can effectively identify the presence and severity of different valvulopathies (heart valve conditions) in order to offer any of the treatments currently available. This is possible, in part, thanks to the knowledge and excellent results in valve repair and substitution of my colleagues, Doctors Carlos Porras, Miguel Such and José María Arqué. In this field, results in such innovative techniques as aortic valve sparing (David and Yacoub techniques) and mitral valve interventions are of the highest level and give a better prognosis, life expectancy and quality of life to patients with valvular insufficiency or stenosis, whether aortic, mitral, tricuspid or pulmonary. My years of professional experience alongside Doctor Juan José Gómez Doblas and the surgeons attending aortic pathologies, and especially my own experience in Marfan syndrome and other hereditary aortic aneurysms, mean that my medical care of this type of condition is clear and decisive. An additional endorsement in the most complex of cases is the fact that I direct the first and only Marfan or Hereditary/Family Aortic Aneurism Unit in Andalusia, the third at national level, and that I have participated in an advisory capacity in the setting up of new units, such as the one in Juan Canalejo Hospital, Galicia, or the Hospital Central de Asturias. I am also a member of the Spanish Society of Cardiology Work Group on Diseases of the Aorta. The Centro Cardiovascular Strachan specialises in cardiomyopathy, valve disease, aortic disease, pericardial diseases, heart arrhythmias, ischemic cardiomyopathy, angina, myocardial infarction (heart attack), heart failure, high blood pressure, cardiovascular risk factors and dyspnea (breathing problems). The technical facilities and the personal experience to be found at the Clínica Cardiológica Dr. Pérez-Lanzac provide specific highly specialised consultations for patients with coronary artery disease (CAD), angina, heart attack or chest pain in general. My training in the non-invasive diagnosis of coronary artery disease is endorsed by the completion of my doctoral thesis in this field of cardiology, by numerous contributions to international journals and by the publication of the first treatise on echocardiography to be originally written in Spanish, which enjoys extensive distribution throughout the Spanish-speaking world. This experience enables me to carry out screening for early detection of coronary diseases using complex studies such as the stress echocardiography, which is painless and avoids the use of radiation or contrasts and the subsequent undesirable effects. The excellent facilities of this heart clinic, which include devices for ambulatory blood pressure monitoring (ABPM) , allow early diagnosis of high blood pressure and optimisation of treatment, in addition to showing the effects of physical activity on blood pressure, thanks to the possibility of completing the study with ( stress tests ). Another advantage of this clinic is that offers my patients the facilities and devices for arrhythmia testing (palpitations, tachycardia, dizziness, or loss of consciousness) with continuous monitoring devices: (Holter-ECG or 24 hour dynamic ECG. This is thanks to the experience I have with the group of cardiologists specialised in arrhythmia led by Dr. Alzueta, with whom I have published numerous articles in international journals on heart arrhythmia and stimulation with pacemakers. The Clínica Cardiológica Dr. Pérez Lanzac specialises in cardiomyopathies, valve disease, aortic disease, diseases of the pericardium, ischemic cardiomyopathy, angina, heart attack, cardiac insufficiency, high blood pressure and cardiovascular risk factors. Cardiologist Malaga, Heart Specialist Malaga, Cardiology Malaga, Fernando Cabrera Cardiologist, Clinical Cardiology in Malaga, stress test, electro, electrocardiography, stress electro, Holter, Doppler, treatment for heart diseases, Cardiovascular Clinic in Malaga, Heart disease treatment in Malaga.